Breaking news – the stock market is doing this. But you’ve heard it all before. If you take advice from the talking heads on TV, the message is scrambled and unclear. After all, ratings is the name of the game. But when Buffett talks, I listen. If you judge by price alone, the market looks frothy. However, Buffett looks at valuation and interest rates together to get a bigger picture of where stocks are headed. Nowhere does Buffett use price as an indicator. On the contrary, Buffett uses the interest rates from bond markets as a yardstick to determine how relatively cheap the stock market is. Like all things, nothing can exist in a vacuum. Stock markets become cheap or expensive relative to interest rates or what he also refers to as "hurdle rates". A hurdle rate is the lowest acceptable desired rate of return on your investment. If yields are at 2%, I doubt anyone would be satisfied with 2% returns from the stock market. It's such an important idea that Buffett has said that if there was only one thing he could know about the future, it would be what the 10 year Treasury Yield would be. It's not the market level, who the president is or what the tax rate it. The formula is essentially the same except the number 4.4 is what Graham determined to be his minimum required rate of return. One using today's 20 year AAA corporate bond rate of 2.85%, and another using today's 20 year A grade corp bond rate of 4.1%. Here is the valuation for the 20 year AAA yield using Graham's formula using Old School Value to simplify the process. When the 20 year AAA yield is used, AAPL's fair value comes out to $264. Compared to the current stock price, the margin of safety is 40%. Re-run the valuation with the 20 year A rate of 4.1% and it now looks like this. 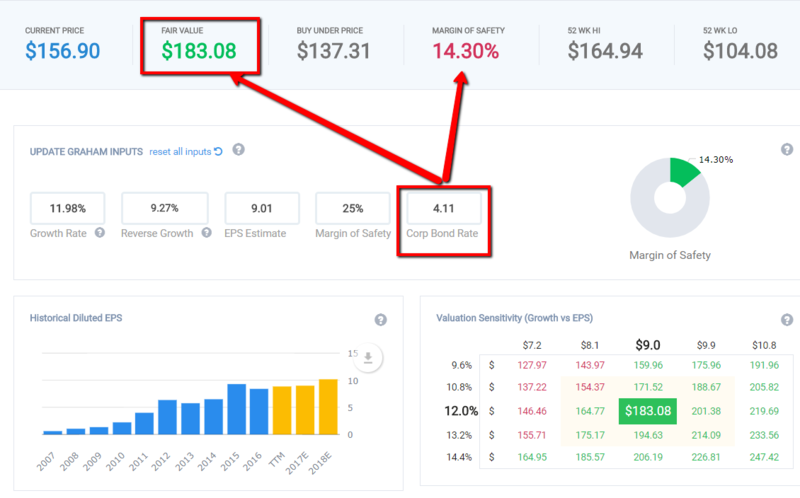 The difference in interest rate has caused the valuation to drop to $183 with a smaller margin of safety of 14%. Ignore interest rates completely and you'll buy high or miss opportunities. On the Old School Value valuation dashboard, we use 3 valuation models to give you different valuation angles. Graham's Formula uses earnings and interest rates to give an approximate value based on current market conditions. We take Buffett's advice and use a 3 stage DCF to value the business based on future cash flows. An EBIT multiples is also used as a relative valuation model. Taking this 3 pronged approach provides for a better valuation range. Here's how AAPL looks right now. 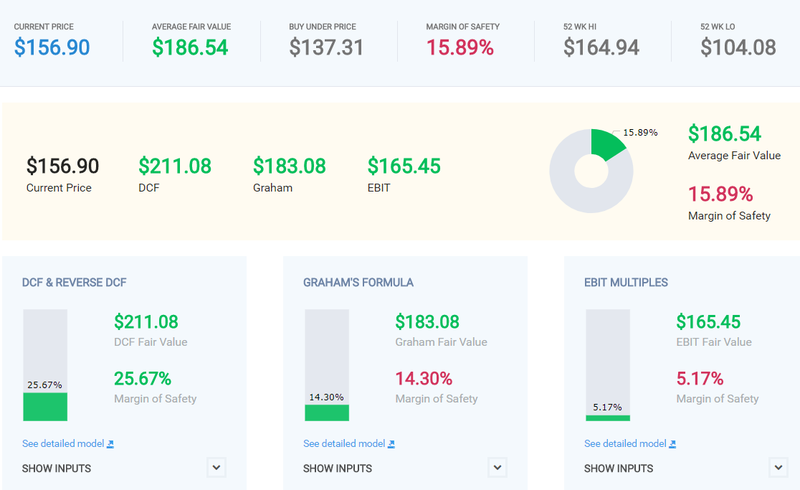 Based on the three valuation models (DCF, Graham's Formula, EBIT multiples), the average fair value is $186 with a 16% margin of safety vs the stock price of $157. Depending on your risk profile, an 16% margin of safety may be too little or just right. But what you see is a range of "what if" scenarios that can take place from $165 to $211. Based on my current assumptions, my thoughts on AAPL is that it is not overvalued at current prices despite how much the stock has gone up. 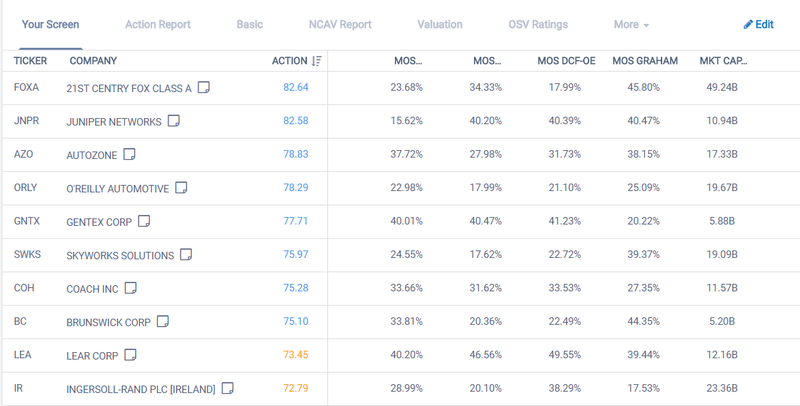 Because searching for undervalued stocks take a lot of time, the process is easier with the OSV screener which includes valuation and margin of safety filters. Here's a sneak peek at how I have mine set up. 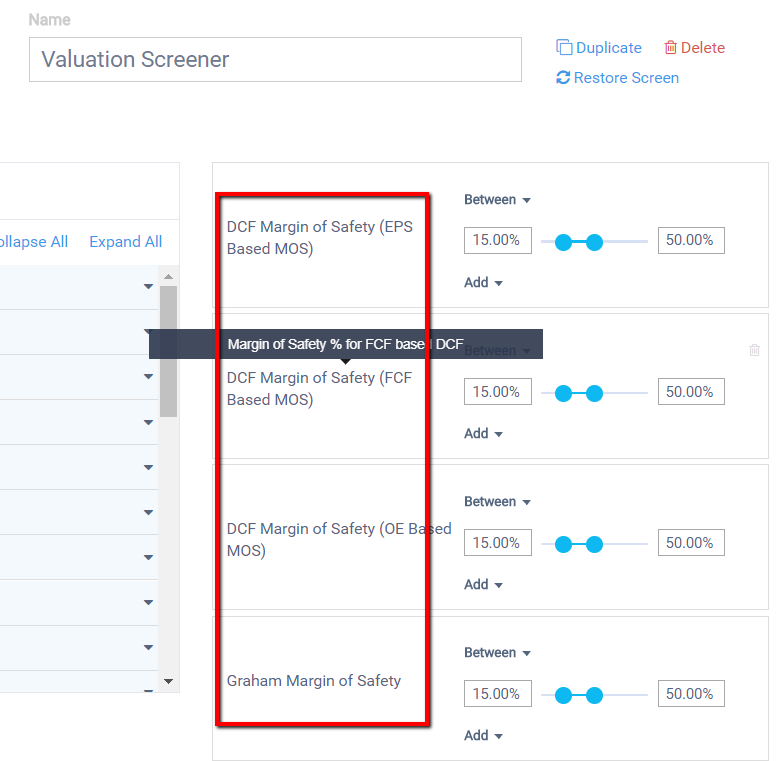 I'm looking for stocks that have a margin of safety between 15% and 50% for the DCF variations and Graham Formula valuation. By doing so, the universe is immediately filtered to stocks that live inside the "reasonable" to "cheap" valuation range. Based on these top 10 results, I see that the auto industry can either be cheap or value. Something to look into but the great part is I did not need to spend an hour to find a cheap industry to look through. The goal of any investor is to fatten their portfolio - and to help you find, analyze and value stocks independently and quickly. That said, here's an exclusive offer for Value Walk readers. Get 25% off the life of your membership thanks to Value Walk. This is a way to permanently lock in a discounted rate. then claim your 25% discounted membership. All plans are fully refundable with a 100% money back guarantee. Recently, I had my home floors refinished. The original plan was to do it on my own. I rented the sander, polisher, lots and lots of sandpaper and it came out to about $1,000 worth of tools for this and that. The work was difficult, tedious, the tools from Home Depot are horrible (sorry but true HD). Not to mention I was doing a 3rd rate job. I called a flooring guy to take over. For $3,800 he finished it in 4 days. It was such a good job that I was ashamed by all the shortcuts I was taking from being overwhelmed, tired and frustrated with the lack of progress. I was purposely skipping things like not taking the doors off to get all the way to the edges, leaving the baseboards on, not prepping the areas properly, using cheap brushes and materials to save a few bucks and the list goes on. What I realized again is that to save at most $2,000, I would have spent 3x more time, more energy, more frustration and anyone could see it was a badly done DIY job. Yes, you can do all the data collecting, valuation, analysis, spreadsheet updates, and the difficult and tedious work that comes with managing your stocks. Or are you knowingly taking short cuts like I did? The high likelihood is that you’ll focus so much on the “work”, you won't see the big picture or get into the real analysis and thinking required to make good investment decisions. By doing it on your own, the cost of your time and work involved will far exceed the price to get it all done for you. And this is the first time we have offered this deal. look good in front of your peers and clients. But best of all, make your life easier and convenient while making money at the same time.